Welcome to Seaham Harbour Online. We hope you will enjoy your visit to Seaham in the north-east of England and will return again and again. Please don’t leave without a visit to our Guestbook. You’ll find it an extremely informative experience and you just might find a name or two which you recognise from the past. Seaham Harbour is a modern miracle of nature and of human collaboration. Seaham’s known history dates back to Saxon or perhaps Roman times as evidenced by the Church of St Mary the Virgin. Seaham is now a rapidly improving seaside town to be proud of . We hope we can give you some feeling for the place and its people on the pages of this web site. A new road, a new era. A virtual walk along the coast. Seaham’s latest cultural acquisition. Located close to Barclays Bank in the town centre the sculpture was unveiled in a ceremony on Sunday, 31 July 2011. 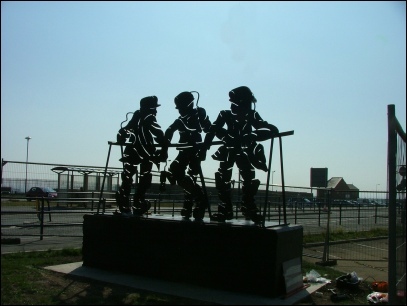 The work is by artist Brian Brown and is dedicated in memory and respect to the industrial heritage of Seaham that fuelled the local economy. It is dedicated to all those who worked so hard below ground and under the sea at Seaham, Dawdon and Vane Tempest Collieries....to provide energy for Britain’s homes and industries for so many years risking life and limb.